I’m currently working on something that requires dealing with the inanities of multiple systems of measurement (thanks USA for doggedly sticking to use of the archaic imperial system). Users can input their height, but to accommodate the US I need to offer the option to input heights in feet and inches. I probably should be doing this client-side with a nice jQuery UI Slider but I’m going for a quick and dirty approach instead which will require server-side translation of the input. 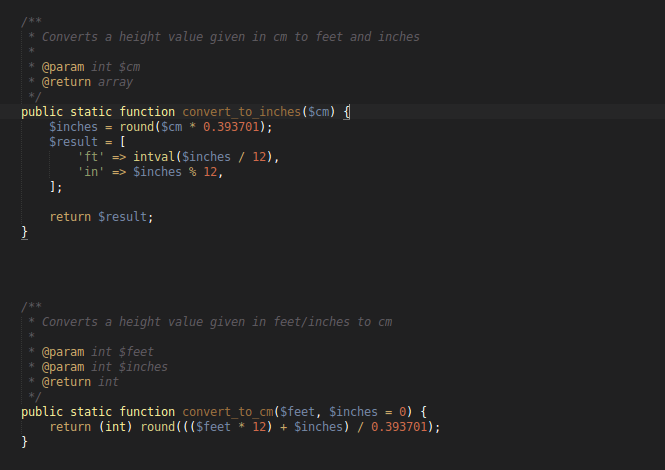 I figured the most useful return value for converting to feet and inches was to send back an array so you can decide how to handle/format them in your controller/template.